Dr. Gerry Cooper, Associate Dean of the Windsor Program called it "a wonderful gesture. It's a manifestation of that critical ingredient - community support." Cooper said it was the hospital that came up with the idea to rechristen the stretch of road in honour of the 24 students. 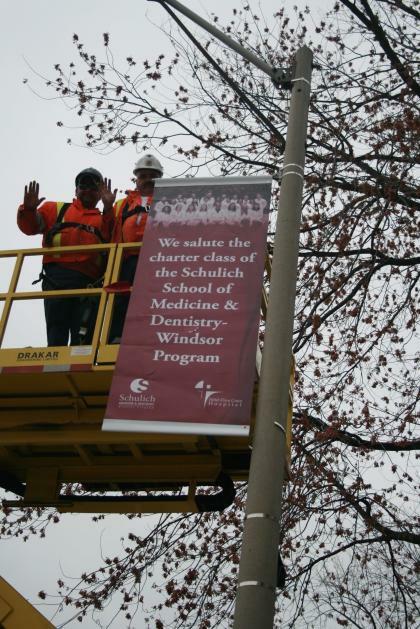 Six maroon banners have been hung on the street lamps with a photograph of the class and the message, "We salute the charter class of the Schulich School of Medicine & Dentistry - Windsor program." Speaking in front of the hospital, Dr. Gord Vail, chief of staff at Hotel-Dieu, congratulated the students, saying that they have all been able to find residencies in their chosen specialization areas. "It's just a great thing to see, watching them grow from these wide-eyed, 'Hey, I'm a med student' to being clerks." Most graduates are headed elsewhere to complete their residencies, but a handful will stay in Windsor for placements in family medicine. Melissa Tenbergen, Meds 2012, said that the experience at Schulich's Windsor Program has been great and that the class has become tight-knit over the past four years. Click here for Windsor Star video of the event.